Join our community of artists and craftspeople working in the facility on a regular basis. The studio’s program is designed for artists with experience in ceramics who are comfortable working independently with clay through the final glazing process. To sign up for the studio’s program, contact the studio at 909-622-0464 or hkreitchet@amoca.org to make an appointment for an entrance interview and studio tour. 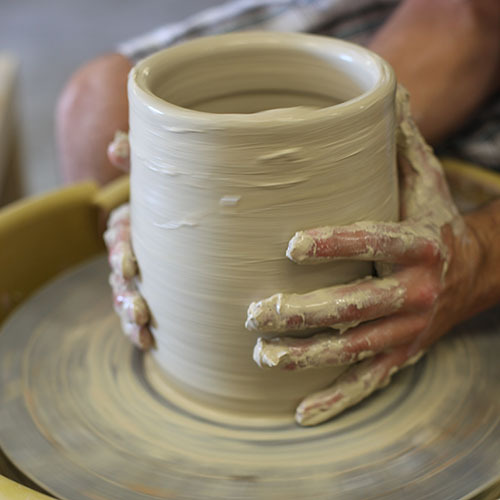 Studio members purchase clay from the Ceramics Studio. Price of clay includes glaze materials and the cost of both firings. Prices range from $20.00 to $35.00 for 25lbs of clay. – AMOCA membership at the $50.00 Individual level for the duration of your studio membership. – Use of our fully outfitted ceramics studio with a large range of equipment and tools including: 15 wheels, 5 hand-building tables, 3 slab rollers, wedging tables, glazing area, extruders, spray booth, and clay-friendly sinks, hand tools, bats, texture tools, and more. – Access to AMOCA’s ceramic reference library of over 3,000 books. A great source of information and inspiration. – Access to AMOCA’s photography studio, by appointment only, all equipment and lighting provided except for the camera. – A shelf approximately 14″H x 15″D x 45″W to store your clay, tools, and projects. Additional shelving is available for $15 per month. AMOCA Ceramics Studio is a growing, vibrant community of potters and ceramic artists of all levels. Studio volunteers assist with teaching, processing clay, mixing glazes, cleaning and maintaining the studio and running pottery sales. Studio volunteers should have some background in ceramics. Please schedule an appointment to discuss your volunteering and work exchange opportunities.